Brown the beef, seasoning with salt and pepper and adding onions and peppers for the last 5 minutes. While this is cooking, mash or food process 1 cup of the chickpeas (garbanzo beans). Also put muffin cup liners in your pan. You’ll want them! Preheat the oven to 375F. When the onions are getting translucent, add the crushed garlic and fresh spinach, washed and roughly chopped, stirring over medium heat for 1-2 minutes until the spinach is all wilted. Turn off the heat. Alternate spinach methods: You could also very quickly steam the spinach separately OR use frozen spinach, about a pound package, but you’d need to thaw and thoroughly drain it first. Add chopped broccoli or any other veggies you want to sneak in there. In a medium sized bowl, beat the eggs, then mix in all the meat and veggie mixture, plus the additional half cup whole chickpeas, lemon juice, oregano, and feta cheese. If you added extra veggies, you may need an additional egg to compensate. Transfer to lined muffin cups with a heaping quarter cup measuring cup and gently press down with the bottom of the cup. Bake at 375F for 30-40 minutes or 15-20 for mini muffins. They’re done when the egg is set. 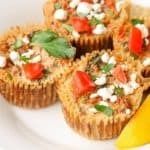 Serve with additional feta and chopped tomatoes on top. Makes 12 muffins or 24 mini muffins (or more if you add more veggies). Did you know you can freeze feta cheese? Don’t ever let a container go bad again. Using it in muffins like these is a great way to get it out of the freezer and onto your plate. Need lower carb? Take the chickpeas right out and just use a whole pound of ground beef. Inspired by Well Fed by Melissa Joulwan.